How many times have you been drenched due to a sudden downpour, or soaked while on your way to work or college due to cheap raincoats? This jogging raincoat made from strong, durable and eco-friendly material provides great coverage and lengthy sleeves to keep you dry - no matter how hard it's pouring - thanks to its high-quality fabric. With over 20 years of experience, we know how to make a good raincoat, suitable for any weather conditions and activities. Why Choose Our Athlete Raincoat? 1. This Unisex EVA Outdoor Travel Raincoat offers a hood and clasps on the sleeves for added protection! 2. Our packable raincoat is just the right size for women and men, and it's Extremely Compact, making it easy to store. 3. It's lightweight and easy-to-carry, making it the best jogging raincoat to have when travelling or going to work. We designed this hoodie rain coat with one thing in mind - your safety and comfort. For far too long, cheap raincoats have only provided people with something to cover themselves with during the rain - but, that doesn't stop them from getting cold and feeling uncomfortable. We go the extra mile and acquire high-quality materials for our raincoats so that you don't just feel good, but look good in rainwear for the first time! So Stop waiting! All you need to do is click the Add To Cart button! Make your order while we have them in stock! ✅ PERFECT FOR TRAVEL: This White Raincoat is extremely lightweight and highly compact. Its portable size and convenient storage bag let you carry it with you wherever you go. ✅ ECO-FRIENDLY MATERIAL: Our Rain Ponchos for women and men are made of high-quality, eco-friendly EVA material and feature a clasp on each sleeve that is breathable, anti-odor properties and ventilation to keep you cool and dry. 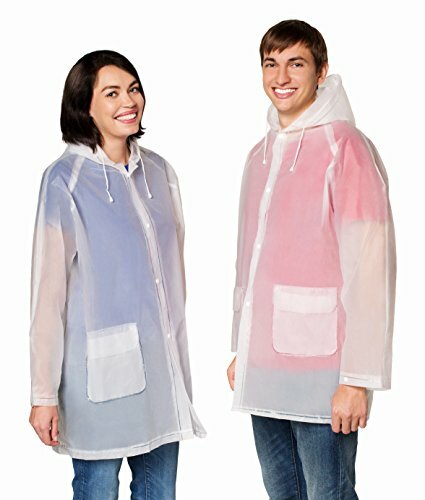 ✅ IDEAL SIZE: This Summer Rain Jacket is one-size-fits-all, and its unique, stylish design makes it perfect for use by both women and men. It's a mini, foldable raincoat that you can easily use for sports or while going to work. ✅ VERSATILE: These Clear Raincoats offer a big, hooded cap and long sleeves that will keep you dry from head to toe. ✅ QUALITY YOU CAN TRUST: Each of our rainwear products comes with a 90-day manufacturer warranty. If our cute raincoat product doesn't live up to your expectations, you will get your money back - no questions asked! If you have any questions about this product by Leger sport, contact us by completing and submitting the form below. If you are looking for a specif part number, please include it with your message.